Saxophone, electronics and percussion duos and trios featuring three radical musicians from Copenhagen, New York and London. 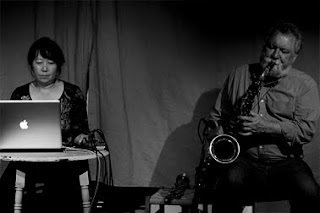 Channeling their experiences of no wave noise, free improvisation, ecstatic jazz, avant-garde composition and experimental electronics, Lotte Anker, Ikue Mori and Steve Noble come together for a unique evening of improvised explorations into unknown musical territory. LOTTE ANKERLotte Anker is one of the most individual voices on the saxophone today, combining the power of Coltrane and Brötzmann with her own unique sense of space and balance. Drawing on the texts of Paul Auster, Jorge Luis Borges and others, she has also emerged as a crucial contemporary composer. IKUE MORIIkue Mori has been a pioneering musical presence since she started playing drums with DNA in 1977. Switching from drums to drum machines to laptop, she is an essential figure in New York's experimental scene, collaborating with John Zorn, Sonic Youth, Evan Parker, and Christian Marclay. STEVE NOBLESteve Noble is London's leading drummer, a fearless and constantly inventive improviser whose super-precise, ultra-propulsive and hyper-detailed playing has galvanized encounters with Derek Bailey, Matthew Shipp, Ishmael Wadada Leo Smith, Stephen O'Malley, Joe McPhee, Alex Ward, Rhodri Davies and many, many more.